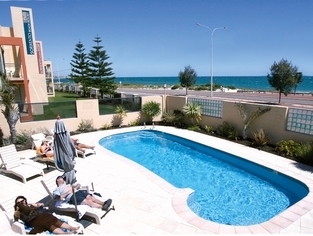 Quality Resort Sorrento Beach is located on Perth's magnificent Sunset Coast, just a 25 minute drive North of the Perth CBD and is the closest accommodation to the beach in Western Australia. 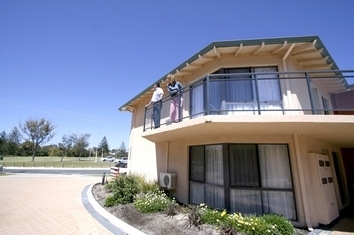 The property can cater from a romantic getaway for two people, through to a family holiday for six and with a variety of room types ranging from our 3-Star Two & Three Bedroom Apartments to our Luxury 4-Star Hotel Studio Rooms and One Bedroom Spa Apartments, there is sure to be something for everyone. 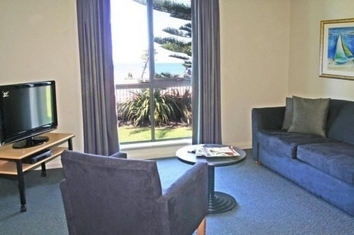 With a beachfront location unique only to Quality Resort Sorrento Beach, these fully self-contained spacious apartments are perfect for romantic getaways, as a relaxing retreat or a weekend break. With outdoor swimming pool, spa, sauna & Bbq area.As a holiday, Sorrento Beach Resort is perfect with Hillarys Boat Harbour, AQWA (Aquarium of Western Australia) and the Rottnest Island ferry only a short stroll away. Our Huge Luxury One Bedroom Spa Apartments are located in our new hotel wing which is 5 years old and rated at 4 Star. Relax in the generous 2 seater spa bath or sit on your private balcony overlooking the magnificent blue waters of the Indian Ocean and sandy beaches just 76 steps away for the ultimate beach retreat. Other options available are in Hotel Style studio rooms also located in the new wing of the resort, or our 3-star Two and Three Bedroom self contained and serviced apartments. The 80 room resort also offers a range of facilities including pool, spa, sauna and BBQ area, boardroom and meeting facilities and the fully licensed White Salt Cafe and Bar (BYO Wine). 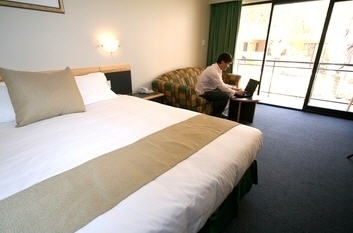 Room facilities include reverse cycle air-conditioning, Pay TV that includes both movies and a selection of Foxtel channels, secure wireless broadband, tea & coffee making facilities, desks with full telephone access, off street and undercover parking and guest laundry. DELUXE SPA apartment with queen bed, fantastic double corner spa, balcony overlooking the Indian Ocean. Separate kitchen/living area with double fold-out sofa that sleeps 2 at an additional cost of $30 per night. 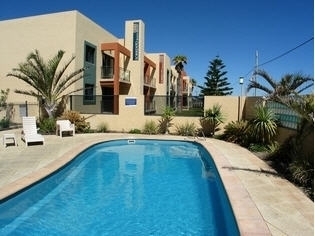 DELUXE SPA apartment with queen bed, fantastic double corner spa, balcony overlooking courtyard. Separate kitchen/living area with double fold-out sofa that sleeps 2 at an additional cost of $30 per night. 3 star, self-contained apartment, with queen bed and 2 singles, sleeps 4. With separate kitchen/living area, this room type is suited to families or groups. These are similar to standard hotel rooms and contain a queen size bed, sofa, tea/coffee making facilities, small bar fridge, toaster, a balcony and ensuite. Suitable for two persons. 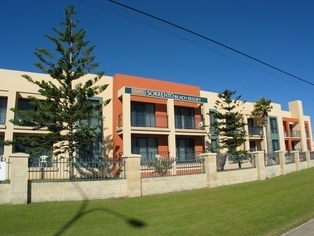 Quality Resort Sorrento Beach specialises in small residential conferences and meetings using our Conference room and boardroom. A secretarial service is available, as is copying, faxing and computer access. Any additional charges are payable direct to the hotel. Plenty of free, off-street, under cover parking available. 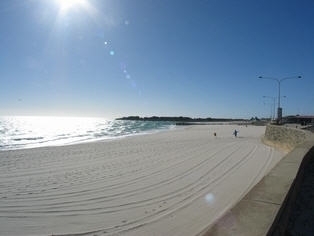 Sorrento Quay is Perth's premier all-season coastal leisure and dining complex in WA's sunset coast. Explore 12,000 km of Western Australia's coastline in just one day. Rottnest is WA's most beautiful Island and is just 18 Kilometres off Perth's coastline. Visit Western Australia's Caversham Wildlife Park, situated only moments from Perth in the Swan Valley. Twenty seven unforgettable holes "Unquestionably one of the world's finest golfing experiences". Come and explore Perth's most spectacular garden oasis, featuring Australia's largest mini golf course. Learn to Surf Perth with quality surf schools at Scarborough Beach. Hop on board and enjoy all that Perth and Kings Park has to offer on a open top double decker bus tour. OR.....If you wish to just relax then laze by our outdoor pool and spa or enjoy the sun while laying on the beautiful beach 50 metres from your room.